Update: Tha article was updated with precise info from Counterpoint Research. Details here. The last year, 2017, was the first year of the re-born Nokia phones. HMD Global, the company that licensed the Nokia brand, patents and that consists of a lot of ex-Nokia employees, launched their first Nokia-branded smartphone. We didn’t see one, in fact, we saw 6 smartphones, of which 5 were available globally. 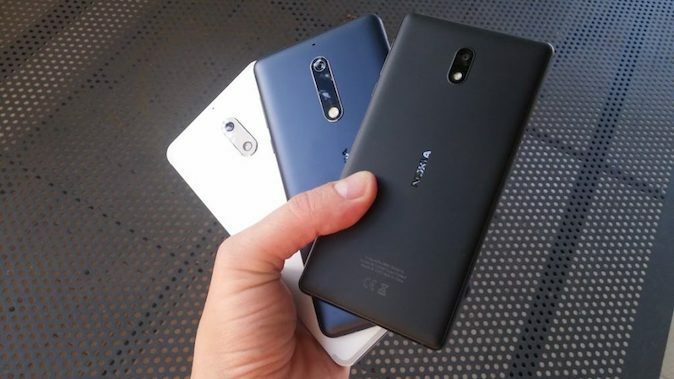 The customers received well HMD’s new Nokia smartphones, and the whole range was universally praised for the build quality, pure Android and regular updates. An important segment for each phone manufacturer, probably the most important, are the sales. To create new, quality, innovative and beloved devices, a company needs to have resource, and resources come from previous sales. In Q1 2017, the first quarter HMD sold smartphones, just the Nokia 6 was available in China were HMD shipped 100,000 units. In Q2 2017, HMD started shipping the Nokia 3, 5 and 6 to some global markets and the shipment reached 1.4 million units, according to IDC. 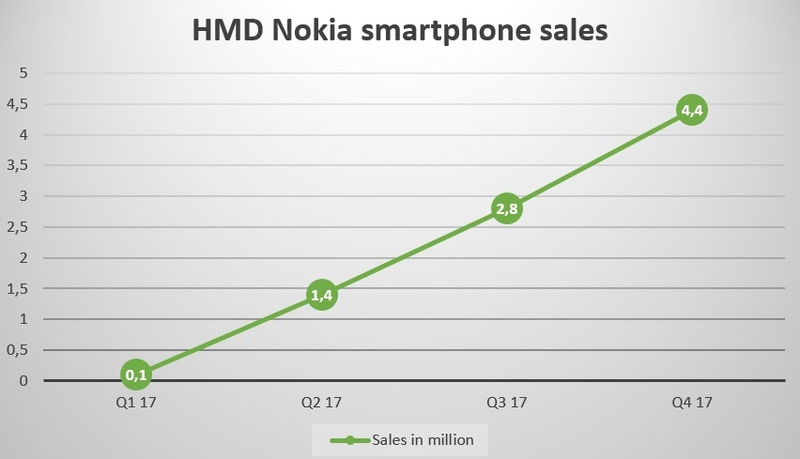 In Q3 2017, Counterpoint Research stated that HMD shipped 2,8 million units, and Counterpoint Research was kind enough (thanks :)) to share with NokiaMob the shipment of HMD Nokia-branded smartphones during Q4 of 2017. 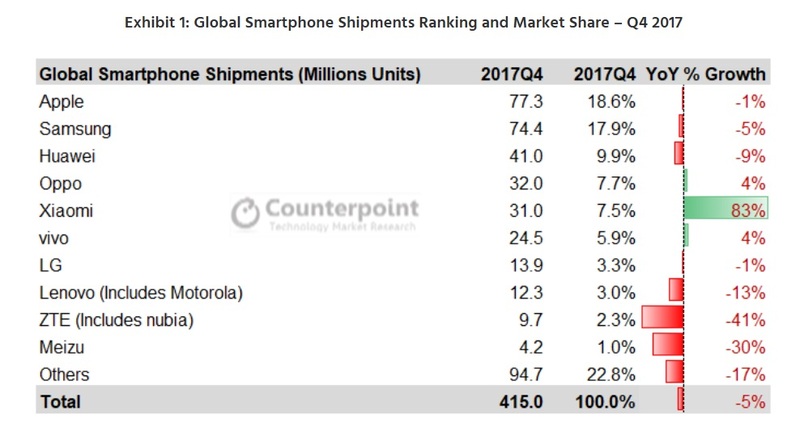 As per data shared with us, Counterpoint Research reports that HMD grabbed 1% of the global smartphone shipments in Q4 2017. That market share roughly translates to 4.15 4.4 million units shipped in the last quarter. The statement from Counterpoint Research follows below. These are great results, in my opinion, for HMD Global. A new player in the industry achieved steady growth during the first year of doing business. In Q1, HMD really had a slow approach releasing just the 6, just in China and via flash sales. The total number of 8.45 8.7 million units last year, of which 8.6 were shipped during last three quarters is a solid number. If we take a look at the top 10 smartphone vendors in 2017, according to Counterpoint Research, the number 10 was Meizu with 4.2 million units and 1% of the market share. This means that Nokia smartphones are on the doorstep of the Top 10 vendors group. If we do a little trick and combine Oppo, Vivo and OnePlus into 1 company called BBK, the owner of the brands, than HMD is most likely among the Top 10 smartphone vendors globally in Q4 2017. We could compare these numbers, for example, with the first four quarters of Lumia sales and first four quarters of iPhone sales. 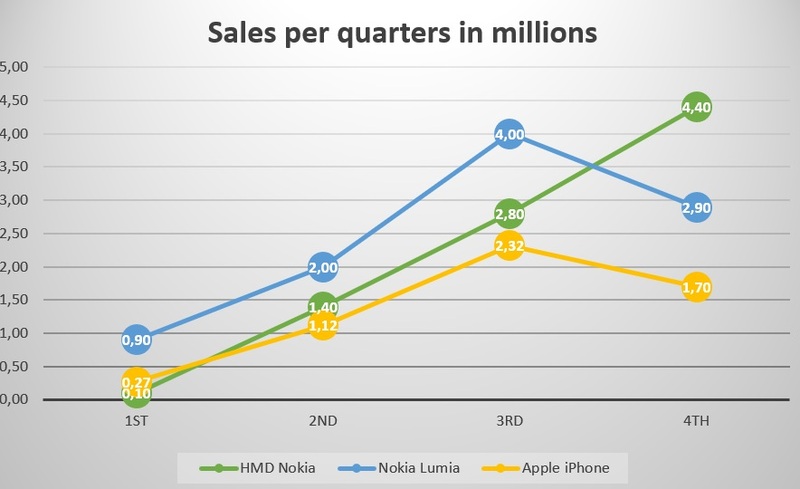 Keep in mind, the first quarter of Lumia sales happened in Q4 2011, and in Q4 there are usually more shipments than in other quarters. For Apple, the first iPhones went on sale during Q3 2007. One has to also take in account the financial power of the company entering a “new” market, as well as availability. Check the graph we made down below. Behind us is an interesting year, where we saw the first steps of Nokia’s re-entering on the smartphone market. In about three weeks, HMD Global is scheduled to announce new Nokia-branded device, and we can’t wait what devices will they show next. Also, feature phones play an important role in HMD’s strategy and it will be interesting to see how they performed, as well.